Rocky Pro Hunter Reversible Fleece Jacket. 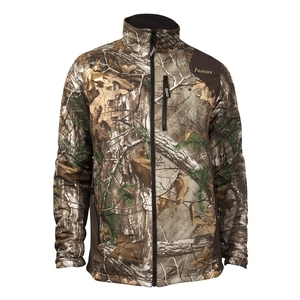 The Rocky ProHunter Reversible Fleece Jacket is ideal for hunting or any outdoor wear. This camouflage jacket is useful on a hunt because Rocky's exclusive Scent IQTM Atomic system helps control human odor on the microbial level, so you remain concealed from your prey. Made of polyester ripstop nylon with Durable Water Repellent, this men's jacket is water-resistant. Inside is a comfortable, warm black fleece lining. Designed as part of a layering system, the reversible jacket can be zipped into the ProHunter Convertible Parka or worn on its own. This outdoor jacket is available in Mossy Oak Break-Up Infinity® or Realtree Xtra® camouflage. Both patterns reverse to become a black fleece jacket.